We don’t think this will buff out, somehow. It’s not uncommon to see some spectacular car wrecks at the Nurburgring as . In this case, however, it wasn’t the fault of the driver as this Porsche 911 GT3 burst into flames without warning while being driven around the Green Hell. Sadly, by the time the emergency services showed up to extinguish the blaze, it was too late to save the German sports car. A video taken at the scene shows how the 911 GT3 quickly became engulfed in flames. Luckily, the driver wasn’t hurt in the incident but the same can’t be said for the car, which was totally destroyed in the fire and reduced to a burnt out shell. The incident happened at the exit of Adenauer Forst. The fire started at the back of the car, which was caused by oil leaking onto the hot exhaust according to a comment posted on the video. As a result, the Nurburgring was closed for two hours while firefighters tackled the blaze. The 911 GT3 that caught on fire appears to be a 991.2 generation model. Why is this significant? As you may recall, back in 2014 . The 3.8-liter motor had a loosened piston-rod screw connection, which damaged the crankcase. These faulty engines were replaced, but some owners started to experience misfires at high RPMs. 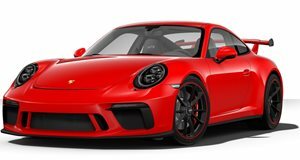 After receiving several complaints, Porsche then extended the warranty to 100,000 miles or 10 years. When designing the , engineers developed a new 4.0-liter unit designed to prevent the problems of its predecessor, and no incidents have been reported so far.